For more than 30 years, the Life’s Most Important Question booklet has presented the message of the gospel in a unique and powerful way. 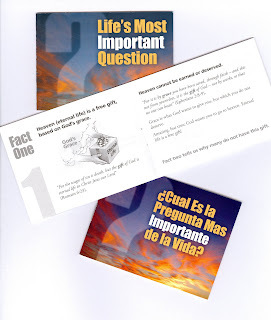 More than five million copies of the tract have been printed in the King James and New International Versions (English), in addition to a Spanish edition. Learn more about the history of this little booklet and its impact world-wide in the July-August issue of FGBC World. Life’s Most Important Question is available at http://www.bmhbooks.com or by calling John Leonard toll free at (800) 348-2756.